Inspired by the lovely Suze from Lavender likes, loves, finds and dreams I decided to spoil one of you with some HAPPY MAIL every now and again! As the surprise factor is already half the fun, you won't know exactly what you'll receive, but I will give you a hint - if you love the series Supernatural then you definitely want to participate! This time the prize will consist of two awesome Supernatural-themed necklaces (purchased by yours truly on Etsy) plus a few lil' extras will find their way into the envelope too! Excited much? I would hope so. P.S. : Don't want to win a pig in a poke as the saying goes? Then simply sneak a peek to get a general idea of what may await you. Congrats to Stephanie Y. from Canada! 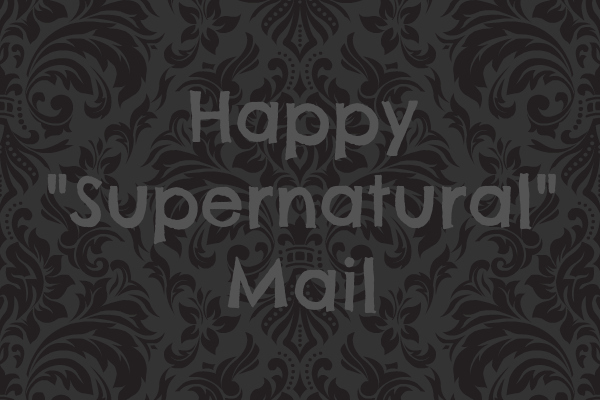 I love Supernatural and I love Happy Mail, thank you.